Lawffice Space - Employment Law Blog by Philip Miles: Employers, Are You Ready for the New NLRB Rules on 4/30/2012? Employers, Are You Ready for the New NLRB Rules on 4/30/2012? Remember the NLRB poster requirement? It was scheduled to take effect (after numerous delays) on April 30, 2012. 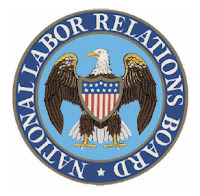 In case you missed it, the NLRB put the rule on hold pending the outcome of some court cases. So, take those posters and throw them in the garbage post them at your own discretion. But, that's not the only rule that was scheduled to go into effect on Monday. The NLRB also plans to implement new election rules (often derisively called "quickie" or "ambush" elections by those opposed to the rule). If you're not doing anything this weekend, here's a great reading list to make sure you're ready for Monday! Eric Meyer's coverage with a Jay-Z tie-in (really? fo' shizzle). Image: NLRB logo used in commentary on the NLRB. Not official use.